This cartoon by Olivier Schrauwen that ran with “How to Rebuild Architecture,” by Steven Bingler and Martin Pedersen in yesterday’s New York Times is most evocative. An architect is directing the attention of another man to his stupid-looking houses but the man’s eyes are drawn instead to a traditional birdhouse. 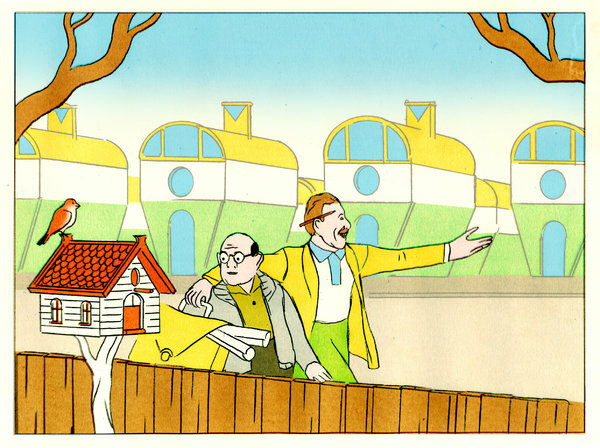 There is a jarring, perhaps unintentional, detail in the cartoon, though – the man drawn to the birdhouse is wearing the round-framed spectacles of the starchitect-wannabe, handed down from modern architecture’s founding father Le Corbusier. But maybe the intent was that the man be seen as a sort of Walter Mitty whose desire for the world’s return to architecture of beauty is hopelessly naïve. And it’s unlikely that this will change so long as the starchitects and their camp followers continue to gull the middle ranks of the profession (and indeed the sizable majority of the public that dislikes modern architecture) into respecting the intelligence behind modern architecture. In fact, the architectural judgment of the public is far more sophisticated than the architectural judgment of those who have been educated as architects. The public’s preference for traditional architecture arises from each person’s long, daily, even hourly experience with architecture from near birth. People have an instinctive knowledge of architecture based on extensive experience that cannot be equated with people’s experience of any other art. Their intuitive judgment deserves a level of respect that is almost never granted them in our culture. They may not have the knowledge to design a house but they do have the knowledge to prefer one that reflects centuries of aesthetic tradition over a house that reflects the rejection of that tradition and exalts a creative process far more dubious. Many of those who look down their noses at the public’s “taste” in architecture (including not a few who commented on the Times essay) are hobbled intellectually by an education that was literally intended to eradicate conventional ideas of beauty from their minds – ideas that still form the judgment, wisely if often unconsciously, of the public on matters of design and architecture. The Times has doffed its hat, however briefly, to this vital set of differences in how the built world is perceived. If a revival of beauty as a factor in architecture is ever to take hold, then it must rely on this discussion reaching a broader audience. Bingler and Pedersen have, along with the Times, done a signal service in helping that process along. This entry was posted in Architects, Architecture, Architecture Education, Art and design, Urbanism and planning and tagged Martin Pedersen, New York Times, Steven Bingler. Bookmark the permalink. Did you notice that he did not use the word tradition? Is it still anathama?